The 1975 California Angels led the American League West in losses. They also led the entire circuit in striking out opposing batters and led all of baseball in shutouts pitched, two distinctions that, along with all the losing, seem to offer some insight into another league-topping mark: catcher injuries inflicted. The team featured one of the most fearsome flamethrowing duos in history, Nolan Ryan and 21-year-old Frank Tanana, that season’s strikeout king. The pair racked up nearly half of the team’s strikeouts and over half of the team’s shutouts. I’m not sure who or what was responsible for all the catcher injuries, but it’s not hard to imagine that the broken fingers suffered by Andy Etchebarren and the fellow picture here, Bob Allieta, came as the result of the terrifying lightning bolts from the arms of Ryan or Tanana. Etchebarren, who already had several years of service as a solid cog in the Orioles’ dynastic machine, recovered to become the team’s regular backstop the following season, but the shattered digit suffered by Bob Allietta seems to have brought his one glimpse of the big time, itself partially the product of the epidemic of Angels’ catcher injuries, to a close. 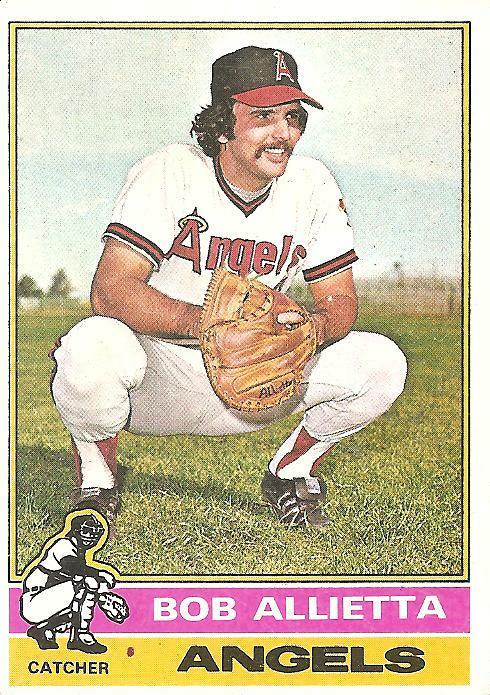 This 1976 Topps card would be Bob Allietta’s first, last, and only appearance as a cardboard god. I also like that he has his name written on his glove, especially as it seems like he started out writing his name in boisterous capitals and then, after three letters, realized he was going to run out of room and had to cram in the remaining letters in lower case. If you can make anything out of such a detail, you’d have to guess that Bob Allietta was that kind of guy, someone who would blunder loudly and affably forward rather than timidly planning everything out in advance or spending time regretting what had already occurred. At first glance, I misread the word along the lower edge of his glove as “ALL STAR,” something he likely hadn’t been since his senior year in high school, but I think it’s not an entirely inaccurate distortion of the situation. Bob Allietta had made it to the promised land, at least for a second. You are currently browsing the archives for the Bob Allietta category.